Francis M. Weston (1887-1969) was founder of the Francis M. Weston Society of Natural History (1947), a Fellow in the American Ornithology Union (1953), recipient of the Silver Beaver Award for his work with the Boy Scouts of America, a regional reporter for Bird-Lore, The Auk, Audubon Magazine, Audubon Field Notes and The Florida Naturalist. When Francis Weston came to Pensacola in 1916 little was known about birds in the western Panhandle of Florida. 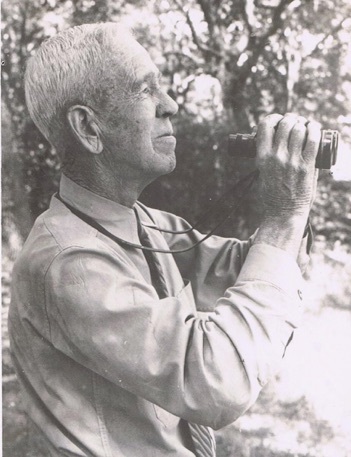 In 1965 Mr. Weston authored A Summary of Birdlife in Northwest Florida documenting his life’s study of that region’s avifauna. His contributions as a naturalist in the area of ornithology have been recognized as invaluable to the understanding of our region’s natural history. On April 22, 1971, after establishing required incorporation articles and bylaws, members of the Francis M. Weston Society of Natural History met for the first time as the Francis M. Weston Audubon Society.